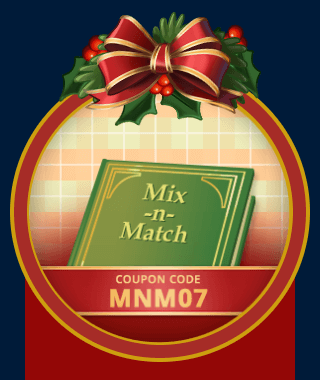 As part of their 25 days of Pogo celebration, all Pogo players can get a free Mix-n-Match badge when you use the coupon code MNM07 at checkout. This coupon code is a one-time-use only code, and no expiration date has been given, so grab your free badge now, because the code might not be available tomorrow. What badge did you choose as your freebie, and why? Let us know in a comment below. yeaaaaaaaaa….I love it when you can pick out your own free badge. Got one for world class solitare. The web page couldn’t be shown because of an internal error. Unfortunately, since you have encountered this error because of some server problem on our end, there’s really nothing you can do at this time to correct the problem. Your best bet is to try again later. Just be sure you are using the number zero and not the letter o ..
yes the zero is put in but it doesn’t work due to a problem on Pogo’s end. Have you tried a different browser? I had the same message and used Firefox and was able to use the code. I tried FF, Google Chrome and IE and got the same message. The message says the problem is at Pogo’s end. Something to do with a server. See message in my post above. I even copied and pasted Lura’s code but it didn’t work for me. Same thing happened with the last code on the 3rd of December. says coupon is invalid or expired and i have been using upper case. not the first time that i have had this problem for free badges and 25%. so now i call it quits. Did you type it? No spaces before or after the code. Have you tried signing out of Pogo when you get the message and then sign back in right away? Or maybe try from another computer or a diff. internet connection. I know it says is a problem on Pogo’s end but if you can try this optio who knows, it may work. Have you checked your albums after you get that message? Maybe the badges are put in your albums even if you get those messages. Check your albums, you lose nothing and the badges may be there already. Thank you Nessa for taking the time to share your tips. Unfortunately nothings works and yes I checked my albums and it is not there. I thinking I might be hitting the same broken server each time I try to use a coupon code. I can’t try a different Internet connection because I am housebound since I broke my ankle and leg on 1st of September. A different computer doesn’t help either. My husband had no problem with using the two coupon codes that came out so far. The second one he tried on this computer and got it using FireFox. I tried again thinking he left me some of his luck but it was no good. HI Catherine, it’s me again….I am having the exact same problem as you did for the last free badge MNM03 and it is the EXACT same way again with this free badge MNM07 for me as well. OBVIOUSLY there is a glitch with Pogo for SOME of us and Pogo is not interested in fixing it for the rest of us. Thank you Cindy for your comment. Yes this is the second time it happened to me also. I guess we are not meant to use coupons. I hope they don’t bring out coupons again. Good luck to those who got to use them. Sadly some of us can’t. What did customer service say when you contacted them? I contacted Pogo when the first coupon code didn’t work and they said someone was working on it. ha ha…then the coupon code expired and the second code doesn’t work either, so basically Pogo did nothing about it. I am having the same problem with you. I have reported it to Live Chat as well as having them call me to no avail. All they say is they will escalate the issue and get back to me. Well, now the first free badge, MNM03 is expired and the free badge today, MNM07 does not work either. I know it is not my computer or web browsers because it worked for my other Screen Name. I applied the free code to the holiday ornament badge, 1 for each account. The code worked with no hitches. A brand new MnM badge for free! I chose the Safari Trouble Afoot. Thank you, Pogo! second time a MNM Code has not worked — so what it happening here? Any attempt to get the code to work with this offering would be appreciated. My cart just sits there and takes about 20 minutes to decide what it is suppose to do with the code — then does nothing, and the cart asks me to pay full price. At this rate, I won’t buy anything. Thanks A Lot! My code did not work, so I tried a different browser and it took it no problem! Very strange, as the earlier code worked in the browser I usually play in. Make sure you use capital letters and type the number 0 and not the letter o. Did you type in the code correctly and then click the apply button? If it sits there for so long maybe is your internet connection. Even if the rest work fine with same connection maybe this code thing don’t. im also having the same problem. mine says oops invalid or expired code. i think pogo and i have a problem. I got the free ornament badge with no problems. tomorrow i saw more mix and match badges are on sale.. I got 1 Mahjong Safari free, so I bought the other one also. Already finished It’s a Sign and now going to do Trouble Afoot. I just LOVE that Safari is back! Even though I liked the original one better, it will still be a favorite. I am just thrilled that Pogo is allowing us to use these coupons on the new badges. Between my 3 Club accounts I got the Ornament Badge and both Mahjong Safari Badges free. I got the trouble a foot for Sarfari. Thank you . Got the “It’s a Sign” badge in Mahj Safari. Quite fun and thanks for the code. It took hardly any time. I got the “Candy Cane Badge” for free in Grub Crawl. I love the looks of that badge, I think it’s very pretty. For those having trouble getting your code to work, I copied Lura’s at the top of this page and it worked beautifully. Good luck! I copied Lura’s code also. It didn’t work. Kept getting a message about a server problem at Pogo’s end. I chose a badge and I have an email confirming that it is mine. However, when I go to the game I can’t click on the badge to earn it because it does not show that it is mine. Try activating it from your Mix & Match Album. It is not showing in my album either. I still have an email from Pogo that says the badge is mine. Was able to pick up another ornament badge. Thanks Pogo. Once again, when my “2nd” account gifted my main account a badge, the badge was in my M-n-M album before I “accepted” it and again I had “not” clicked on my homepages “gift” tab. BTW, when Pogo gifted us the most recent PBA, it did “not” appear on My Collection page until I accepted it. Be advised I do want the M-n-M badge gifted by my second account. However I’m concerned if Pogo gifts us a M-n-M badge I do not want. Have a “great” and “safe” weekend everyone! I got the Word Whomp “Resourceful Speller” Badge. Thanks Pogo!! A naive question here. I know I can get the 16 gem ones….got a Jungle Gin one the other day. Can I get the 25 gem ones………..and to really push it, can you get the 96 gem ones?? Just a thought cuz I have my eye on one that is 25 anyway, lol. Colour me “frugal Scot”…….Heather, lol. I got a 26 gem badge with the first code. I did try to see if I could get a bundle and it wouldn’t let me. Today, I was unable to get the 26 gem badges. Again, no bundles. I did get a 20 gem badge for Word Whomp. I got 1 MJ Safari badge on my main account and gifted the 2nd MJ Safari badge from my 2nd account to my main account. Thanks to ev1 above who noted the new MJ Safari badges that came out. I chose the Wind Surfette badge in Word Whomp because I liked the fairy. I saved 20 gems. Thank you, Pogo! Bought 2 Ornament Badges, got one for free early this morning! Woo hoo!